Dillon's Shoppers Can Support Futures Unlimited, Inc.
January 2017 - Do you want to help Futures Unlimited? Are you a Dillon’s shopper? With the Dillon’s Community Rewards Program you can support Futures Unlimited just by shopping at Dillon’s! All you have to do is enroll your Dillon’s Plus Card or create an account with Dillon’s Community Rewards online. After you sign up, Futures benefits every time you shop and swipe your Plus Card. There is no cost to enroll and you continue to receive Plus Card prices and fuel points as before. The organization with the biggest percentage of purchases by dollar amount will receive the biggest percentage of the $500,000 each quarter! To date, Dillon's has donated over $1,000 to Futures. All money donated will go directly benefit the men, women, children & families served by Futures, at no additional cost to you! *Specific purchases that cannot be included are: alcohol, tobacco, fuel, Pharmacy purchases with government assistance (i.e. Medicare, Medicaid, TriCare), postage, bottle deposits, lottery, Western Union, other customer services, promotional tickets, sales tax, banner gift cards, reloadable gift card products (i.e. Visa, MasterCard, American Express, Green Dot). We would like to take this opportunity to let the many direct support professionals (DSPs) who work at Futures Unlimited know how very much they are appreciated. Children like Easton could be eligible to receive full day preschool services at Futures Unlimited, Inc. beginning in September thanks to a recent Head Start expansion. January 2017 - Do you want to help Futures Unlimited? Are you a Dillon’s shopper? 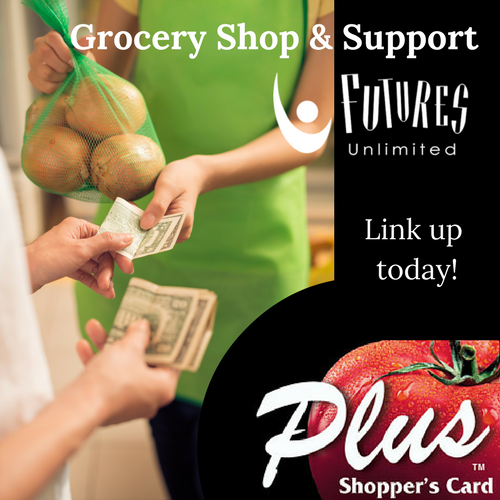 With the Dillon’s Community Rewards Program you can support Futures Unlimited just by shopping at Dillon’s!